This book collects 56 original monsters for Dungeon World, organized in page spreads by climate and terrain type for ease of use at the table. Each one of the concise and suggestive entries is accompanied by an illustration. 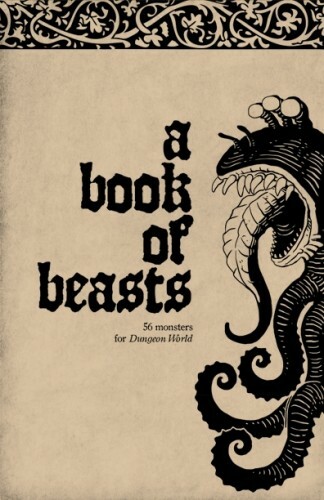 Perhaps the player-characters in your Dungeon World campaign will meet their end in a storm of parasitic Flurry Worms, robbed of thought in their sleep by Dream Eaters, or lost in a maze created by an Architect Lichen; these and many other calamitous critters await your call within A Book of Beasts!